Our centers offer an expansive selection of spinal orthotic solutions. We’re focused on delivering the right spinal solution to meet our patients most challenging need. The Orthotic & Prosthetic Centers offer a variety of both custom and prefabricated spinal orthoses depending on patients diagnosis. 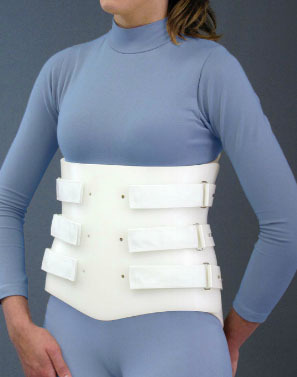 Here are the types of spinal orthoses products we provide. This orthosis is designed to accommodate volume changes as well as circumferential support. 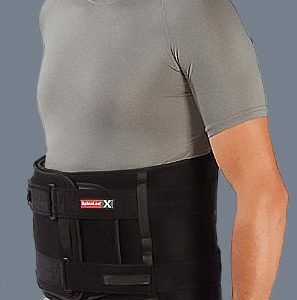 It also has the ability to create intra-abdominal compression. This particular design provides the maximum degree of control with comprehensive adjustability due to volume changes. 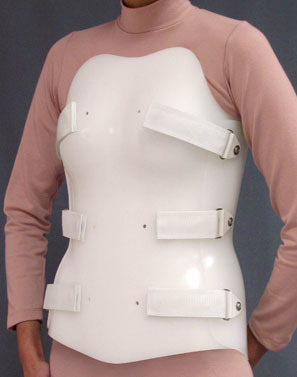 This style allows for ease of donning and doffing and quite often used in post-operative situations. This orthosis is designed to be acceptable for the patient who is unable to tolerate a solid plastic anterior panel. It features adjustable hook and loop closure straps for ease of donning and doffing. 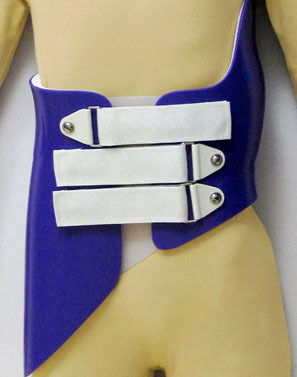 The orthosis design shown is a single opening LSO with a hip joint and thigh cuff. This style allows for greater adjustability while limiting motion. Adjustment bars are positioned on orthosis and thigh section for adjustability. A variety of joints are available. This particular design allows the maximum degree of anterior and posterior control and accommodates volume changes. The Flex Foam I orthosis is designed to combine the rigidity of a traditional orthosis with the comfort level of a soft body jacket. A unique feature of this orthosis is the removable exterior frame which can be trimmed by the orthotist to improve anterior, lateral and posterior rotational control. This orthosis design is also ideal for both geriatric and pediatric patients. It’s lightweight and soft foam increases comfort for patients. The Flex Foam II orthosis is fabricated with the frame sandwiched between a soft foam inner liner and firm foam outer liner. Thinner frame can be fabricated with any desired plastic type and thickness for desired rigidity. This orthosis is lightweight and works well with both geriatric and pediatric patients. This bivalve design accommodates volume changes. 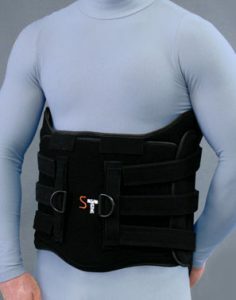 Sternal shield with adjustable angle allows for extension control and the sternal bar adjusts for height. 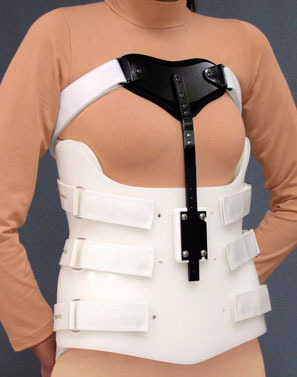 This orthosis relies on a series of pressures and void areas to exert corrective forces on the spinal column. 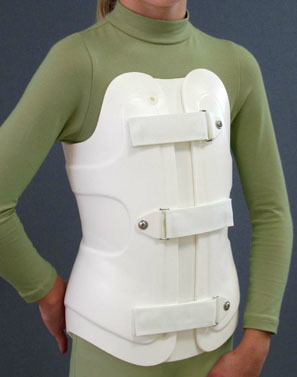 This is a full-time bracing system for treatment of ideopathic scoliosis. The Providence Nocturnal Orthosis combines precise grid coordinates of a patented measuring board with the utilization of a CAD CAM system to aggressively correct the scoliotic curves while the patient sleeps. lumbar, thoracic, double major and thoracolumbar. 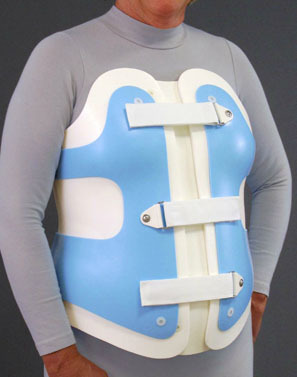 This orthosis is suited for neurologically involved patients, idiopathic adolescents and juvenile scoliosis patients as well as obese patients. Because of the nocturnal design, it is able to address an apex of T6, which is higher than can be treated by a full-time scoliosis orthosis. Apices above T6 can be treated with a neck extension attached to the orthosis. 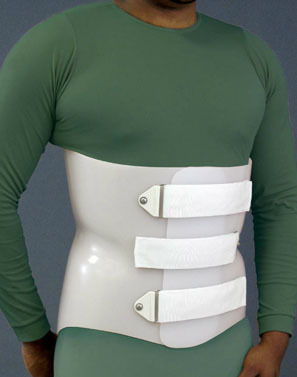 The Milwaukee design is suitable for treatment of scoliosis and/or kyphosis. 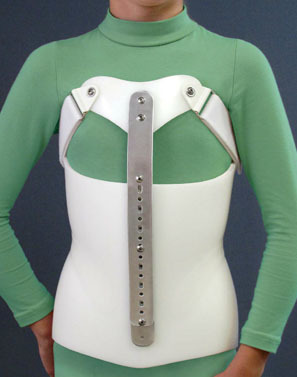 The low profile neck ring is an option for scoliosis treatment with apices higher than T7. 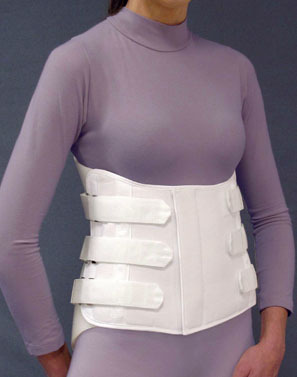 The high profile neck ring works best for kyphosis treatment. 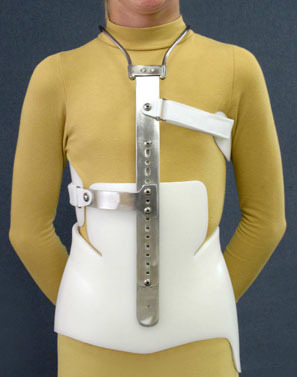 This orthosis offers multiple adjustment capabilities, the neck rings can be raised or lowered. The thoracic and axilla pads can be tightened or loosened to influence correction and to center the patient within the superstructure. For kyphosis, static pads can be attached to the posterior upright or a dynamic floating pad to anterior cross bar. This low profile design is easily concealed under clothing increasing compliance. Anterior Milwaukee bar with sternal shield allows for height adjustments and external force. The posterior is reinforced to allow corrective force at apex of kyphosis. 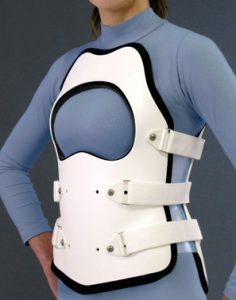 The adjustable anterior Milwaukee bar and sternal shield can be used in conjunction with the full-time scoliosis orthosis for treatment of kyphoscoliosis. As well as customized orthoses, The Orthotic and Prosthetic Centers offers prefabricated spinal orthoses to meet individual patient needs. These orthoses designed to meet the requirements of a number of diagnosis and conditions, including: spinal fractures, kyphosis control, osteoporosis, lower back pain and spinal stenosis. All these prefabricated orthoses are lightweight and ease donning and doffing. 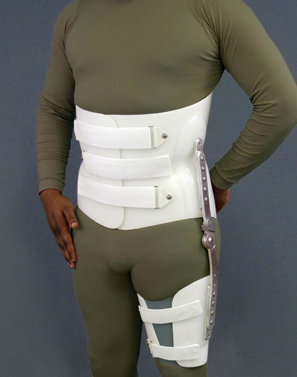 SpinaLoc Orthosis with two piece construction provides structural integrity.